The energy research activities at the TU Darmstadt form the starting point for this special demonstration project. After the founding of the TU Darmstadt Energy Center in 2007 with more than thirty energy-research-related departments and the establishment of a master degree program in Energy Science and Engineering and the Darmstadt Excellence Graduate School for Energy Science and Energy Technology, current developments in this area are focused on the development of an Energy Expertise and Application Center and the project EnEff:Stadt Campus Lichtwiese, funded by the Federal Ministry for Economic Affairs and Energy (BMWi). With these activities, the TU Darmstadt has already made noteworthy contributions towards the furthering of the energy revolution.The CUBITY project documented here constitutes a further building block in the context of these activities.At the same time, CUBITY ensured the continued and highprofile presence of the TU Darmstadt at the Solar Decathlon. The Solar Decathlon is an international university competition started in 2002 on the initiative of the United States Department of Energy. Between 2005 and 2011, it took place every two years in Washington D. C. Since 2013, the event’s location has varied, thus spreading its influence throughout the entire country. 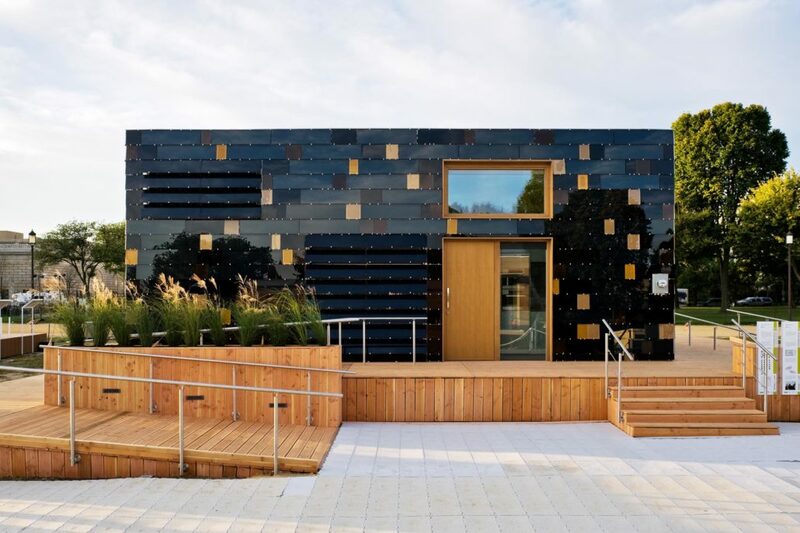 Since 2010, there is also a European competition, the Solar Decathlon Europe, which takes place biannually in various European cities. In 2010 and 2012, the event took place in Madrid; in 2014, it took place in Paris. Recently, offshoots of the competition have been held in China and South America. In each competition, up to twenty pre-qualified teams from colleges and universities from around the world compete against one another. The purpose of the Solar Decathlon is to present the potentials of solar and sustainable construction, as well as of solar energy generation, to a wide public through realized objects in the context of a building exhibition.In accordance with the name, Solar Decathlon, the competition is made up of ten disciplines. The buildings designed and constructed by the university teams are assembled on the event site—similar to a building exhibition—and compared to one another in ten disciplines. Each discipline is made up of five objective and five subjective categories. That means that half of the criteria are measured (temperature, humidity, illuminance, electricity generation, energy consumption, etc.) and the remaining criteria are assessed by the expert jury, which takes tours of the buildings. 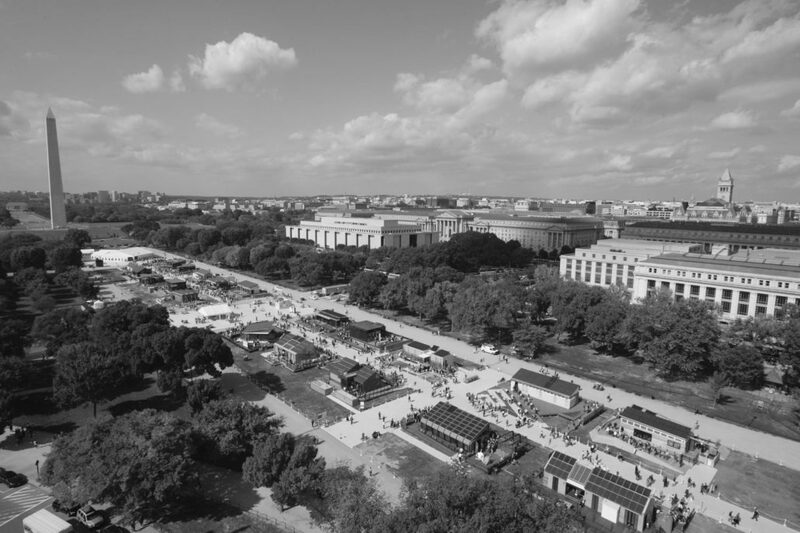 In 2007 the first German team, under the direction of Prof. Manfred Hegger from the unit energy efficient building design at the TU Darmstadt, took part in the Solar Decathlon in Washington D. C. for the first time. 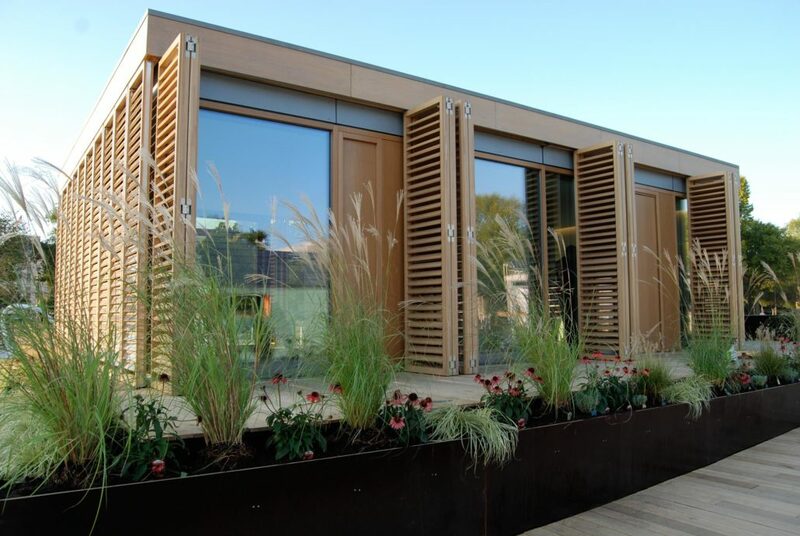 To the surprise and ultimately the fascination of all involved, the German team won the Solar Decathlon 2007, in which only one other team from Europe had participated. Two years later, the team defended its title in the USA. Both projects still enjoy great interest; they are located on the Lichtwiese campus of the TU Darmstadt. To this day, visitors come from around the world to visit the buildings. Through this and the participation of Prof. Anett- Maud Joppien in the Solar Decathlon Europe 2010, the TU Darmstadt gained international recognition for the design and construction of energy-plus buildings. The house, which is designed for two people, has an area of fifty-four square meters. The architectonic concept of the small building is based on simple, flexible solutions. The characteristic elements are two rooms; one for sleeping and one for living. The energy concept is based on the use of passive systems first, before making use of active systems integrated into the architecture of the building. As a result of the compact building form, the building envelope is reduced; it additionally boasts a high insulation standard. The building is constructed following the onion principle, with various layers that are arranged around the inner core. Both the electricity and the heat supply are provided by renewable energy sources. Three different types of photovoltaic elements deliver the necessary electricity. The heat supply is covered by solar thermal collectors and a heat pump. This house is based on a one-room concept; in the middle there is a two-story construction in which all the necessary functions such as kitchen, bathroom, staircase and storage space as well as the entire technical aspects are integrated. In the surPLUShome, energy conservation, efficiency and production are synchronized. The building envelope, which is constructed to the passive energy house standard, ensures low energy losses and high comfort. Various forms of photovoltaic technology which are integrated into the building envelope—on the roof and in the façade— provide energy. The building envelope is therefore a central aspect of the design not only from a design perspective, but also from a technological point of view as a solar-active layer, owing to the increasing energy demand. In total, two and a half times more energy can be produced by the house than is necessary for a two-person household. The overarching idea was to develop a building which, with only small changes to the building envelope, could be moved from a warm to a moderate climate. The building design is based on two solar-active wall panels. The living space is located between these two walls; through sliding glass elements, the room can be opened on both sides and transformed into a flowing space. A supporting structure on the wall panel straddles the interior space with no further supports. In the interior, a multifunctional, two-story construction is the defining element. Over the course of the year, the building generates more energy than the residents use. 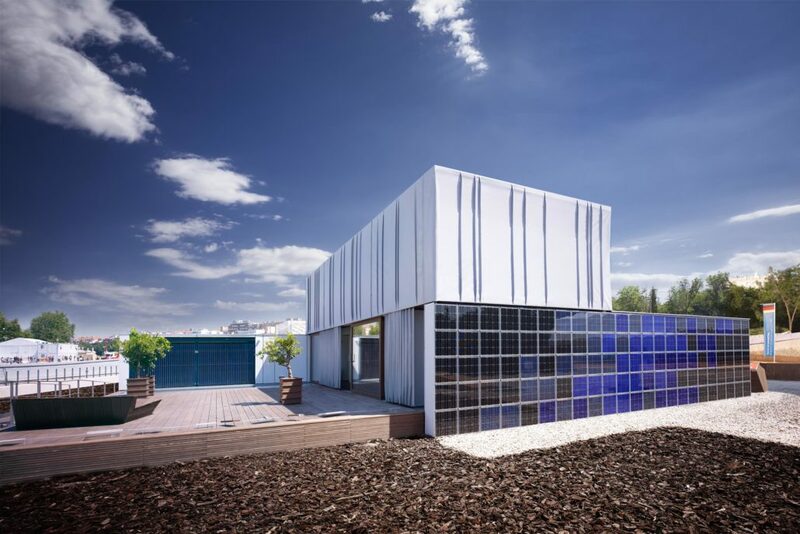 115 individually designed photovoltaic elements are integrated into the solar-active south wall. Solar thermal collectors on the north wall produce hot water. The compact ventilation unit has an air/water heat pump, and is able to both heat and cool.